President Barack Obama has tapped the head of the Vermont National Guard for a top post in the U.S. military’s homeland defense. Adjutant General Michael Dubie has been nominated as the deputy commander of the United States Northern Command, or NORTHCOM. That’s the military’s unified command in charge of protecting U.S. territory and providing military support for civil authorities in the event of a national emergency. Dubie’s nomination has been sent to the U.S. Senate for confirmation. If confirmed, Dubie would become a three-star general and he would vacate his position in Vermont. 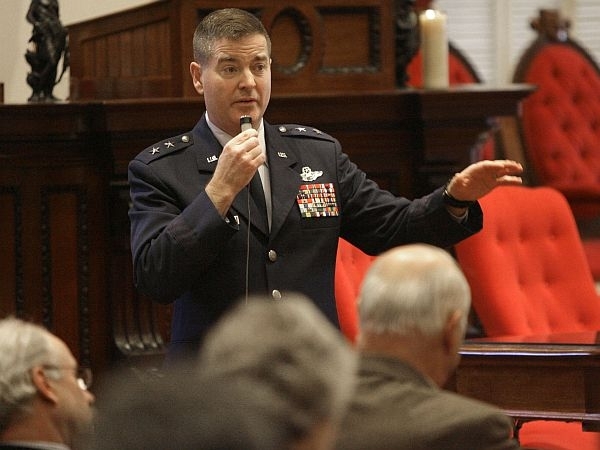 A new Adjutant General would be named by the Legislature during its next session. Dubie has served as commander of the Vermont National Guard since 2006. Senator Patrick Leahy praised the nomination. "This is a vital and sensitive role, and the president has made a wise choice," Leahy said in a statement. "General Dubie is a proven leader. In commanding the Guard in Irene’s wake, during the Vermont Guard’s major deployment to Afghanistan in 2010, and in maintaining one of the most responsive Guards in the nation, he has met every challenge. My only regret is that the nation’s gain is our loss of a truly outstanding adjutant general," Leahy said. Vermont National Guard Commander Michael Dubie is preparing to depart for a top post in the U.S. military’s homeland defense mission.